As the years go by, it's somewhat inevitable that the rich narrative of history gets distilled down to a few key players and major events. Such streamlining is arguably necessary in order to get a good look at the “big picture”. By doing so, however, we risk losing some of the quikier fringe figures and their stories that may not have had as huge an impact on the story of mankind, but are important and intriguing nonetheless. One such figure is the subject of Gillian K. Willman's short documentary The New Woman: Annie 'Londonderry' Kopchovsky. Annie Kopchovsky was a fairly ordinary housewife and mother who, as the result of a wager, in 1895 set out to became the first woman to ride around the world on a bicycle. She won the bet, and along the way she became something of a feminist icon before fading into obscurity. At least that's the story Annie told. The truth, as Willman shows us in her film, is a little less simple. The New Woman is approximately 30 minutes long, and that seems about right for this particular story. Willman does an excellent job of presenting her subject in a breezy and balanced manner, blending interviews with some of Annie's descendants with archival photos, animation, and a narrator who reads newspaper accounts of Annie's exploits from the time. 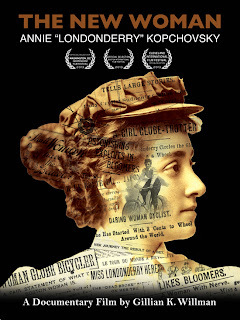 In addition to Annie's story, the film also of necessity discusses the bicycling craze of the late 1890's as well as the interest in “around the world” trips and other exotic adventures that provided the backdrop for Annie's personal voyage, little historical details that, like the film's primary subject, rarely if ever make it into the history books taught in schools. Like any good American folk hero, Annie was larger than life and prone to embellishing her adventures. And in true American capitalist fashion, she blazed a trail for countless celebrities to come by selling ad space on her bicycle and clothing. Whether any of this diminishes her actual achievements is up to the individual viewer. However one feels about Annie, though, her story as presented here is never less than fascinating. 3 out of 4 stars.